There are a variety of available low testosterone treatments or TRT (testosterone replacement therapy) options for those with low testosterone levels. The basic low testosterone treatment is any one of numerous synthetic testosterone preparations, and although each provides adequate levels of hormone replacement, each also possesses inherently positive and negative characteristics. The selection of a specific testosterone preparation depends on many factors including the magnitude and pattern of serum testosterone levels produced, reversibility if an adverse event should occur, side effects of the particular formulation, cosmetic issues related to the preparation, convenience of use, and cost. It is therefore incumbent upon you to find and adopt the preparation that best suits your lifestyle. While there are benefits, oral low testosterone treatments can carry a significant level of hepatotoxicity due to the methylated nature of many oral testosterone forms. The exception would be Andriol Testocaps; however, they carry their own potential problems. Oral testosterone can also be harsh on cholesterol. Due to their short half-lives, oral testosterone treatment requires daily or twice daily administration to ensure adequate blood concentrations. This factor increases the possibility of missed dosages, especially if you're unaccustomed to taking vitamins. Some Patients also experience a roller coaster effect as there levels can yaw up and down with this treatment method and only get a mild bump in total elevation of testosterone levels. 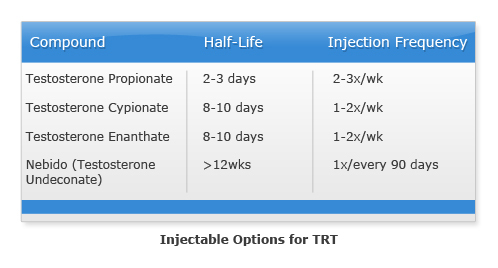 A major misconception of the half-life interpretation is that many doctors and TRT clinics alike use the testosterone half-life as guide to administer injection times. Take for instance Cypionate (12-16 days) there are many educated physicians that prescribe one injection every two weeks or three injections a month according to the medications physical half-life. While this is a common practice such a low testosterone treatment plan is wrong and only provides the patient a roller coaster affect as his levels go up, peak and crash a few days post injection. With Testosterone Cypionate and Testosterone Enanthate, the most commonly prescribed testosterones, the individual will receive a strong spike in testosterone approximately 48 hours post injection and reach his peak levels within that time frame. From here, testosterone levels will steadily decline back towards a baseline level if the common low testosterone treatment plan is followed. For optimal results, patients should inject their testosterone hormone twice per week or at minimum once per week in order to maintain homostatic levels that best replicate natural testosterone production that occurs during the age of 20-25. The very popular testosterone patch is another possible option. The patch utilizes transdermal (through the skin) delivery, and comes in multiple brands and dosages. Although considered uncomfortable by some due to possible skin irritations, the patch must be administered daily. Approximately one in twenty men will experience skin irritation through transdermal patch low testosterone treatment plans with products like Androderm or ATMOS. Transdermal patch low testosterone treatment plans are convenient so as long as you remember to apply the patch daily. The patch is merely attached directly to the skin of the shoulders, upper arms, thigh or abdomen. The skin must be clean and dry before the patch is applied. While undoubtedly convenient, some patients will find they only receive a mild testosterone boost that isn't strong enough to remedy their condition. Androderm is the most popular testosterone patch commercially available. It is applied daily, and produces serum testosterone levels that mimic normal circadian changes, and are equivalent to the normal midrange for young adult men. Attachment sites should be rotated daily, allowing at least 7 days between same site use. A segment of the population is allergic to the adhesive used in patches, and can experience a variety of skin irritations. Transdermal absorption profiles can vary greatly among individuals, even those who apply the patch correctly. The Androderm patch affords some dosing flexibility because it is available in two sizes (2.5 mg and 5 mg), but the patches should not be divided. The testosterone gel or cream is another low testosterone treatment preparation, which in part borrows many of the best characteristics from other applications. For example, it's absorbed transdermally (through the skin) like the patch, requires more frequent (daily) administration similar to tablets, and elevates serum levels quickly like both the aforementioned mechanisms and intramuscular testosterone. The transdermal gel AndroGel, manufactured by Unimed Pharmaceuticals is the most well known gel used for low testosterone treatment. Even though it boasts solid delivery reliability, it has the same caveat as transdermal patches, i.e. varying absorption profiles. Some patients may find their testosterone levels do no increase enough in total necessary to remedy their low level condition, and this will require the patient to move to other forms of low testosterone treatment. Recently, another transdermal testosterone gel, Testim from Auxilium Pharmaceuticals, was approved for use in the United States. The serum levels of testosterone obtainable with Testim appear to be similar to those obtained with AndroGel, but both slightly elevate serum DHT levels which can advance male pattern baldness and possibly aid in benign prostate hypertrophy (enlarged prostate) Since its debut, testosterone gel and creams has been a very popular preparation primarily because of their great convenience. Testopel is a subcutaneous crystalline testosterone pellet approved in the U.S. for the treatment of men with testosterone deficiency syndrome. This long-acting pellet is inserted subcutaneously (between skin layers), and can provide a sustained testosterone release for 4-6 months. For obvious reasons, such a method is not as popular as some of the other preparations mentioned above, but these pellets are still just as effective. Patients are required to undergo a surgical procedure to implant the pellets each time and the sensation of the pellets to some is annoying and bothersome. However, this remains one of the more effective low testosterone treatment plans as it provides a steady, even release of testosterone in continuous fashion. There are several possible side effects of low testosterone treatment plans that may occur. However, most men will tolerate most types of testosterone treatment plans extremely well. Testosterone is not a foreign substance to the body, and it is one that is essential to our health and wellbeing. Some may, however, have issues with gynecomastia (male breast enlargement) due to testosterone's estrogenic nature. This can also lead to water retention. Anti-estrogen medications can prevent such side effects of low testosterone treatment if needed. Cardiovascular issues are also possible although rare. In fact, those with low testosterone are at a far greater risk of poor cardiovascular health than those with optimal testosterone levels. If you are under the care of a well-educated and capable physician, all of the possible side effects of low testosterone treatment are avoidable. There should be no side effects of low testosterone treatment if your physician implements the plan properly. With testosterone boosters, while we are increasing testosterone levels through supplementation this is a different process than true low testosterone treatment. True low testosterone treatment plans use synthetic testosterone preparations, which literally replace the body's lacking testosterone it is, for whatever reason, no unable to produce on its own. Over the counter testosterone boosters, normally comprised of varying vitamins and minerals, while they can increase testosterone levels will rarely do so enough to combat low testosterone. Both synthetic boosters and herbal supplements can have negative side effects, but the third category of testosterone boosters works by employing specific foods and resistance training. Consuming certain food substances is another way to effectively increase testosterone levels. · Cholesterol: Although generally considered a substance to avoid (for its tendency to promote plaque buildup within arteries), your body both requires external and internally produces its own cholesterol. Proven to improve testosterone levels, good concentrations of cholesterol can be found in many of the protein-rich foods a fitness conscious person would normally consume anyway, such as eggs and lean red meat. These foods are good for you as long they are consumed in moderation and kept lean. · Fat: Fat is another one of those testosterone improving substances, that's been saddled with a bad reputation. The healthier mono- & polyunsaturated fats from such foods as fish, seeds, olives, and nuts, along with the unhealthy (in large quantities) saturated fats found in whole fat dairy products, avocados, and butter actually work with your body to increase testosterone production. · Zinc: Zinc is a well-known multi-faceted mineral that provides many bodily benefits including wound healing, tissue repair, immunity improvements, bone health, and blood clotting. However, it is also a great sperm and testosterone boosting mineral. Zinc is found in high amounts within beef, pork, oysters, turkey, pumpkin seeds, and chicken liver. It is also found, in lesser amounts, within almonds, sunflower seeds, wheat germ and lentils. Weight training is a very effective way to increase and sustain your natural testosterone levels. The general working of muscles (locomotion and respiration) very mildly stimulate testosterone secretion, however, when your muscles are thoroughly taxed via routine weight training exercises this release is exponentially increased. As you already know, weight and cardio training are good for you on numerous levels, but it would be of great benefit to begin a training regimen if you're serious about naturally enhancing your testosterone levels. Specifically, lower body training, especially programs which incorporate free-standing/universal bar squats, have been shown to optimize the weight-trained release of testosterone.